Donald Trump pulled off a huge upset on Tuesday, sending stock futures tumbling. But investors should take a deep breath before doing anything precipitous. Donald Trump has scored a stunning upset in the 2016 presidential race, defeating heavily favored Democratic nominee Hillary Clinton. For the second time in five months -- the first being Brexit -- investors were caught flat-footed by the backlash against the political establishment. U.S. stock futures plunged overnight, as many traders rushed to sell their holdings due to fear about how Trump's unorthodox policy positions will impact the economy and financial markets. Investors have reacted poorly to Trump's apparent victory. Image source: The Motley Fool. 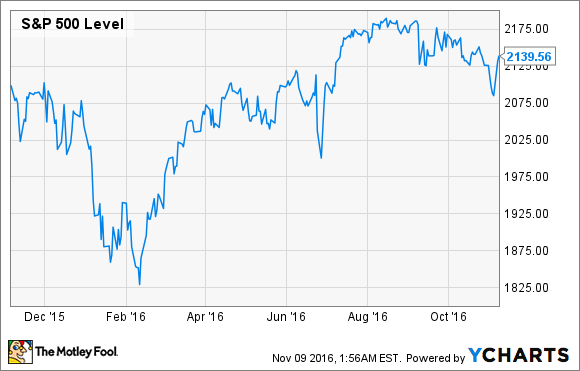 However, investors shouldn't be panicking about a Trump victory. In the long run, businesses that produce popular, high-quality products and services can overcome a lot of turbulence. Many companies will even benefit from Donald Trump's policies. As for those that have been the targets of his ire -- such as Ford Motor (NYSE:F) -- the damage will likely be minimal. Trump and Clinton have some very big differences on economic policy. On taxes, President-elect Trump's policies are more business- and investor-friendly. He has proposed reducing the corporate tax rate all the way from 35% to 15% and allowing U.S. companies to repatriate foreign earnings at an even lower 10% tax rate. Trump also wants to reduce tax rates (including capital gains taxes) for high earners. By contrast, Clinton ran with a campaign message of making sure the rich pay their fair share. That suggests she would have had little or no interest in changing corporate taxes. Meanwhile, Clinton proposed raising income and capital gains taxes on the wealthiest Americans. Meanwhile, on trade, Trump's policy proposals have been widely seen as dangerous for investors. He has railed against U.S. trade deals, vowing to tear up the NAFTA agreement that covers free trade with Canada and Mexico. Trump has excoriated companies like Ford for opening factories in Mexico to take advantage of lower wages there. Trump has also stated that he wants to declare China a currency manipulator. He has argued for combating cheap imports from places like China and Mexico with steep tariffs. In general, Trump wants to move the U.S. away from its historical role as a major promoter of free trade. Clinton agrees with Trump on some trade issues, such as her plan to crack down on alleged currency manipulation and commodity dumping by China. Clinton also joined Trump in opposing the Trans-Pacific Partnership (after initially appearing to support it). However, in general, she staked out a more orthodox position on trade during the campaign. On Monday -- after the FBI cleared Clinton for a second time -- the stock market rallied, on the assumption that a Clinton victory was now more likely. In a single day, the market regained nearly all the ground it had lost in the previous two weeks. Late Tuesday night, as the election started to tilt toward Trump, U.S. stock market futures plunged by about 5% -- the maximum possible movement in a single session. Many investors have viewed Clinton as offering a continuation of President Obama's policies, while Trump wants to dramatically shake up U.S. trade and immigration policy. 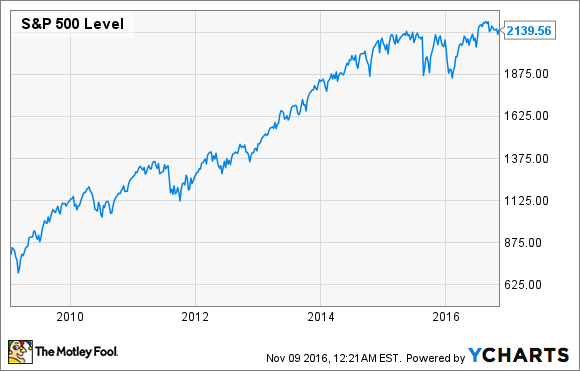 Given that the stock market has soared over the past eight years, it's not surprising that Mr. Market saw Clinton as the safer bet. S&P 500 Performance Under President Barack Obama, data by YCharts. In the immediate aftermath of the election, there have been plenty of dire predictions about what a Trump presidency means for stocks -- including from people who should know better. For example, Nobel Prize-winning economist Paul Krugman opined, "If the question is when markets will recover, a first-pass answer is never." In the short run, there will probably be some turbulence. But investors should recall that the market plunged more than 10% in the first few weeks of 2016 -- and still reached all-time highs by the summer. Financial shocks aren't always all they are cracked up to be. S&P 500 Performance, data by YCharts. Moreover, some companies will be big beneficiaries if Trump actually implements the policies he has proposed. U.S. Steel (NYSE:X) is a case in point. U.S. Steel has lost money in two of the past three years as it suffers from dumping (selling below cost) by Chinese steelmakers. The U.S. government has acknowledged this problem and slapped high tariffs on Chinese steel, but Chinese steelmakers have found workarounds. A more assertive trade stance against China (and other steel exporters) could help domestic producers like U.S. Steel immensely. Companies with huge offshore cash piles could be big winners, too. Apple (NASDAQ:AAPL) has $216 billion trapped outside of the U.S. because it is unwilling to pay the steep 35% tax it would owe if it repatriated that money. Trump's tax holiday proposal (offering a one-time 10% repatriation tax rate) would save Apple more than $50 billion if it brought home all of its offshore cash. Apple would then have enough money available to pay a $25-$30 special dividend (or buy back an equivalent amount of stock) and still have a rock solid balance sheet. Even longtime Trump punching bag Ford Motor could actually come out ahead from a Donald Trump presidency. Trump might impose high tariffs on auto imports from Mexico, but that would impact many automakers: not just Ford. Furthermore, Ford only expects to save $300 million annually by moving small car production to Mexico. Meanwhile, it booked $2.9 billion in income tax last year. Trump's proposal to cut the corporate tax rate from 35% to 15% would slash that tax bill by more than half. Ford will save tons of money if corporate tax rates are cut. Image source: The Motley Fool. More broadly, every company that pays the full statutory corporate tax rate (or close to it) will save a huge amount of money if Trump can implement his corporate tax reform agenda. With Republicans expected to control both branches of Congress, that's a real possibility. Investors should brace for a lot of red in their portfolios in the next few days and weeks -- and perhaps even months. But Donald Trump's victory on Tuesday doesn't mean you should change your investing strategy on Wednesday. For most companies, Trump's policies should have little or no negative impact on profitability. If stock prices ultimately fall more than 10% -- and especially if they fall more than 20% -- investors should consider putting more money to work in the market. As long as you are willing to ride out losses for a few years if need be, buying stocks after the market crashes is a proven strategy for earning strong returns. Having Donald J. Trump as president isn't likely to change that.